Discussion in 'Gibson SG' started by UTGrad, Jan 25, 2019. I see the 2019 SG HD has a flame maple top. 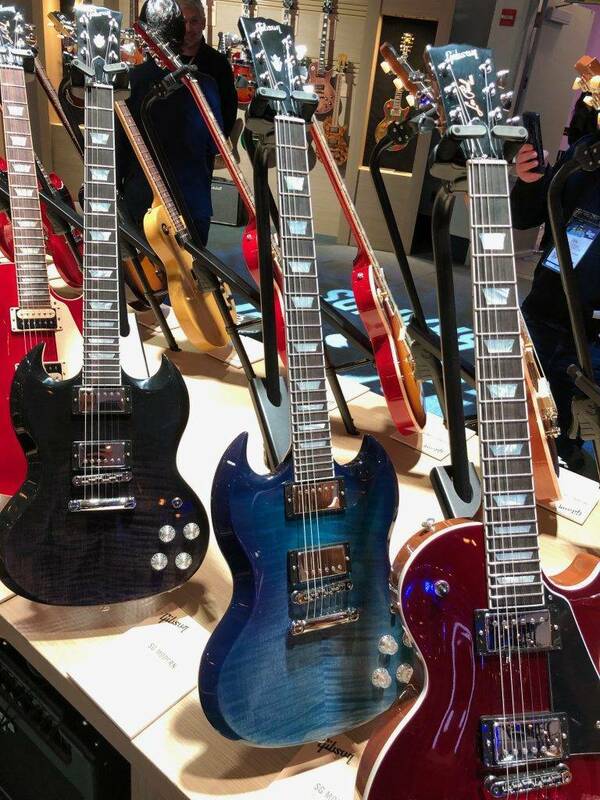 Do the maple tops change the tone characteristics of the SG? Sound more like a Les Paul? Nope, depends on the pickups. It will never sound like a Les Paul with same settings, if only because of pickups position. For the first part of your question, it depends who you want to believe, but I'd say the biggest factor is the BurstBucker pickups, coil splitting and DIP switch. All that will make a lot more difference to the tonal characteristics than a maple cap could. I dont think so... I dont have a HP, but the body of a Les Paul (not planks like the MM, Jr, Special) gives the sound more bottom. An SG will in most cases not sound like a LP, but pickups matters too. But while the LP is chambered, the SG is a plank, and that results in two pretty diffferent sounds. When I pick a string on my SG, it goes plank plank. The importance of the pickups (and their placement relative to the bridge) outweighs the wood by... a lot. PermissionToLand, Dale and Daniel.S like this. The importance of the pickups outweighs the wood by... a lot. Edit: not really sure if that answers OP question, but IMO your SGs wood will have no or little effect on your sound - but the pickups will, like mentioned! I definitely agree there is a difference, but I think most of it comes from the pickup placement in relation to the bridge (provided the pickups are the same, though!). However, there are so many variables involved in a guitar, that it's really hard to compare different models. I tend not to worry, whatever sounds good must be right. When it comes to making an SG sound like a Les Paul I would say yes, you can. You can make it sound exactly like a 1961-early 63 Les Paul! PermissionToLand, Dale and Ray like this. brazilnut and Ray like this. My 2018 SG HP has maple sounds the same as my previous 2017 SG standard so no noticeable impact. PermissionToLand, Biddlin and Ray like this. Ah... thats right, hehe! LPs from those years rules, awrite, hehe. Need more coffee here it seems..
Daniel.S and Gahr like this. As for me, I think that I sound like I sound, whatever I plug in, it's me. So why bother ? Play what you have and find YOUR tone. customs etc. ... some of them have three pickups. I believe that Gibson built them to look pretty, not to sound different. listen carefully, observe... then return and report. We'd like to hear what you think on this subject. as they'll let you. Plug them into the same amp, and listen. Then tell us what you perceive. and you will also sound like your self on an SG with a mahogany body. My suspicion is that you can get more tonal variation by turning the tone controls than by switching guitars. Or by switching amps. This is a ''vintage tone pedal..." with secrets revealed. brazilnut, Paul G., Ray and 1 other person like this. Unless the maple cap is pretty thick it won't really be relevant .How thick are they? A maple cap may (or may not) change the intrinsic tone, I dunno. Conventional wisdom says it should be a little brighter, but to honest I love an SG for being a fairly bright guitar as it is; I can move my picking-hand around and get Tele, or Les Paul depending on where I hit the string. If it does nothing for the tone, meh, I don't like paying for bling. If it makes the tone brighter, it's solving a problem I don't have. Not being big on bling either, there's nothing making me say get one. For myself, a thin slab of hog sounds damned close to right, it doesn't need a cap. brazilnut, cerebral gasket and DrBGood like this. Doesn't mass also effect tone. The Les Paul has more mass than an SG. brazilnut, Thumpalumpacus and Ray like this. I have live recordings of myself playing Telecasters, SGs, Solid Les Pauls, Chambered Les Pauls and Firebirds. They sound more the same than they do different. Once I was in the high-end room of a GC and they had a Guild Artist Award. This is a carved, full-size hollow-body jazz guitar. I played it a bit and asked my wife what she thought. She said "it sounds just like your other guitars". At first I thought "Pshaw", then I played some more and really listened. She was right. Whether it's my right hand, left hand, phrasing, whatever, I could have been playing a Les Paul, more or less. I get guitars that have a decent basic tone and good feel (looks don't hurt), and go from there.